home > content management systems (CMS) > joomla! The tutorial we have written below outlines the steps for adding an email form to your Joomla! website. The process is fairly quick and easy, especially when using a 3rd party email form service provider. Before working on the Joomla side, it is important to first generate some form HTML code for insertion. The easiest (and best) way to create this code is via a free form service called myContactForm.com. We have written a complete article for using myContactForm.com. a. 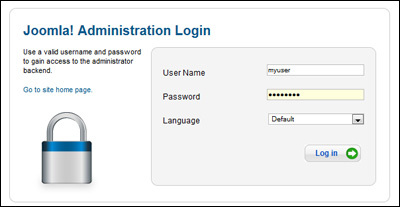 Go to your Joomla web site and login to the administration panel. Below we are outlining the steps for adding an email form to a new article. Note that you could use a very similar process to add an email form to an already existing article. 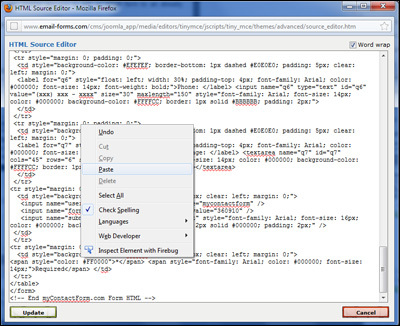 c. Paste the form HTML into the HTML Source Editor window (CTRL+V or Right Click and Select Paste). If you do not have your form code created and copied, please read this tutorial to learn how to do so.